The Winnipeg Jets have been a pretty strong team for 5-on-5 hockey. They currently place sixth in the NHL for score-adjusted Corsi, the best measure for even strength play (excluding goaltending impact). A large part of that effective play has come from the Jets being big, fast, and aggressive. When you are big, fast, and aggressive, you will end up getting a few penalties called on you; however, the Jets are getting more than just a few calls against them. They lead the league in penalty minutes and it’s a bad thing. Everyone knows the Jets lead in penalty minutes, but few realize how badly. The Jets have averaged 6.67 minutes of shorthanded time a game, while the league average (mean) is 5.04. The second worst team in penalty minutes is the Columbus Blue Jackets averaging 5.75 penalty minutes a game. Yes, the Jets are further from the second most penalized team than that team is to league average. Drawing and getting caught with penalties is a big deal. The Calgary Flames has been outperforming their shot differentials, and a league best 3.72 penalty minutes a game is a large part of it. The Winnipeg Jets penalty kill is 15th in the league with 5.95 goals against per sixty minutes, just under half a goal under league average. Despite average penalty killing, their number of penalty minutes has caused them to allow the second most short handed goals against. The Jets have allowed 39 goals against while on the kill. If you keep their goal against rate equal and reduce their penalty minutes to league average, that goal against number falls to about 29. Improve to the discipline level of Calgary and you have about 22 goals against. For context, an improvement of three goals in team differential averages out to just over a point in the standings. This also excludes the fact that the Jets are also pretty good on 5v5 situations and would benefit from more minutes there. Three points on average just for becoming a middling team in discipline. May seem like a small amount, but every point counts in this league. As of yesterday prior to the Washington Capitals game, the difference between 13 wins and 10 wins (six points) in the Jets final 23 games was the difference between 99.5 and 51.6 percent chance of entering the playoffs. Of course, there is the counter argument that the Jets aggressive play leads to these penalties. The graph above is Jets penalties broken down by type. The data was put together by Japers’ Rink writer Muneeb Alam. The Jets recent rise in penalty minutes does seem to come mostly from the “aggressive” category. 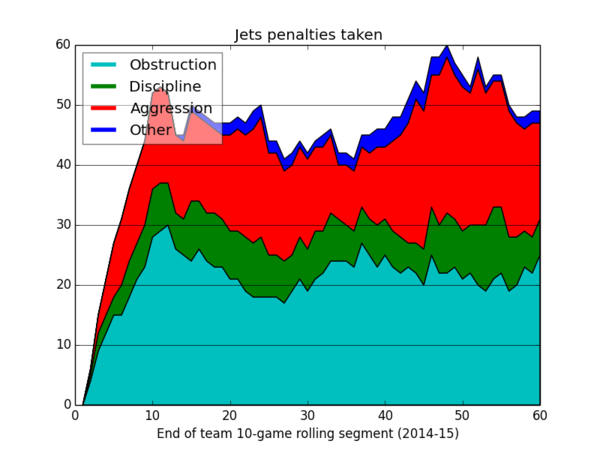 For much of the season the Jets averaged about one aggressive penalty a game, but that has risen to two a game. The aggressive type penalties are the ones though that could be argued extends as a byproduct from the Jets “heavy” style. That doesn’t mean that they are justifiable penalties or couldn’t be reduced. Paul Maurice may be able to use the aggressive excuse for those ones, but the rest not so much. The Jets are averaging a combined 3 penalties of discipline and obstruction penalties a game for most of the season. This is where Maurice needs to start impacting the team. Keep the stick down. Stop clutching and grabbing. Be aware of who is on the ice and how many. If the Jets start playing with more discipline, they could push themselves to the next level. If not, the Jets may be seeing summer early yet again. 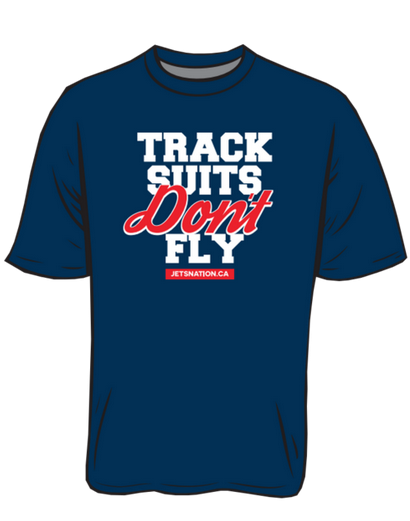 We have an awesome brand-spanking-new t-shirt available for purchase here. Shipping in Canada is free as in 0 dollars and 0 cents. Also, part of the proceeds go to Earth Group and there focus in helping those in need around the world. Also, the first 100 customers at The Pint in Winnipeg for the Jets game on Saturday, Feburary 20th, will receive one ABSOLUTELY FREE!